Ransom Center Director Steve Enniss elaborates on the honor of housing Gabriel García Márquez’s archive and how he envisions it reaching far beyond Austin. Fighting back against the loss of memory Aureliano Buendía in Gabriel García Márquez’s One Hundred Years of Solitude takes up a brush and paints on the objects and creatures of his town their proper names, as if participating in a creation story. Gabriel García Márquez’s own written letters have come to rest at the Harry Ransom Center, resisting the loss of memory, and also laying hold of—in a permanent and lasting way—the words and legacy of one of our finest and most beloved novelists. The decision of Gabriel García Márquez’s wife and children to place his personal and literary papers at the Ransom Center is a great honor. With the establishment of the Gabriel García Márquez archive, Gabo (as he is affectionately known the world over) has entered history. Like a character in one of his own novels, he has entered a place outside of time. Somewhere among these papers Florentino Ariza still waits outside the house of his first love; somewhere a colonel waits patiently for the weekly post. An archive is a timeless thing, and for years to come the materials that have been collected here will give up, to those who are patient, insights into the art of Gabriel García Márquez. The Ransom Center is honored by the family’s decision to entrust these letters, photographs, and manuscript drafts to us, and we look forward with great expectation to the new life his words will be given in the coming years. The truth is any number of institutions might have been chosen, such is García Márquez’s global audience in both English and Spanish. The author from Aracataca made the local universal and in doing so became a citizen of a republic of letters larger than his native Colombia, larger than his adopted home of Mexico, and larger even than all of America north and south. The Harry Ransom Center is one of the country’s finest humanities research libraries and museums. It exists to advance the understanding and appreciation of our cultural heritage. A truly international research center, last year the Reading and View Room served scholars from 30 countries around the world. In the few short months since this collection arrived, our cataloging staff has been organizing the collection for research use while conservators have been painstakingly conserving and housing the most ephemeral of these materials. 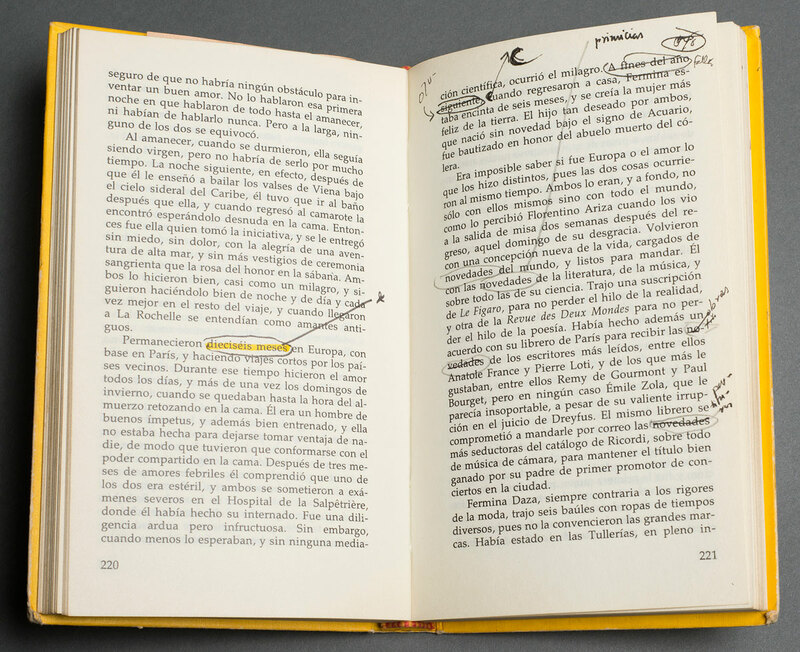 Our digital initiatives, including plans to digitize a large part of the Gabriel García Márquez archive, will extend the reach of this collection far beyond Austin. From October 28-30, a three-day symposium planned by University of Texas at Austin Latin American studies faculty will celebrate the life and work of Gabriel García Márquez. People from around the world will be able to watch the symposium panels via a live webcast at hrc.utexas.edu, gaining an understanding about the achievements of García Márquez. The Ransom Center looks forward to further collaborations which the presence of this archive will stimulate for years to come, collaborations among readers everywhere, among all those who are drawn to García Márquez’s fictional worlds for insights into our own common humanity.